Without resonances, there cannot be a lifelike sound! The main goal of conventional technology is the elimination of resonances by heavy damping and flattening of the frequency curve by powerful crossover filtering. This pays surprisingly little regard for the sound itself. Unfortunately, no difference is made between undesirable and desirable resonances. The basic acoustic principle remains: Without resonances, there cannot be lifelike sound. Music is played by instruments; hence authentic sound reproduction must also require instruments featuring harmonious resonances. While conventional loudspeakers produce illusions, they fail to sound lifelike, since all resonances have been eliminated. 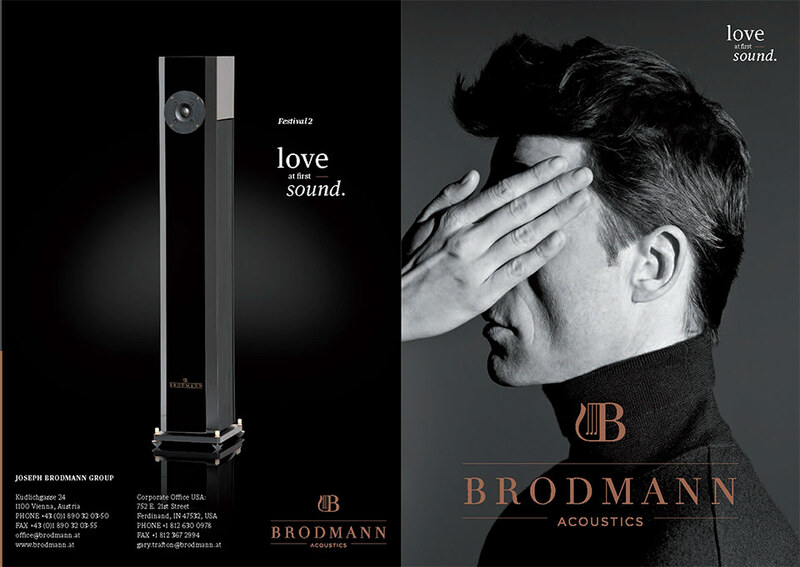 Brodmann loudspeakers are instruments in themselves. Of course they don’t employ active resonators with instrument-specific sounds, as musical instruments do, but instead they use passive resonators, creating a neutral sound. It is only through this coupling that the resonators or absorbers are brought to vibration (after Hermann Ludwig Ferdinand von Helmholtz, inventor of the “Helmholtz Resonator”). 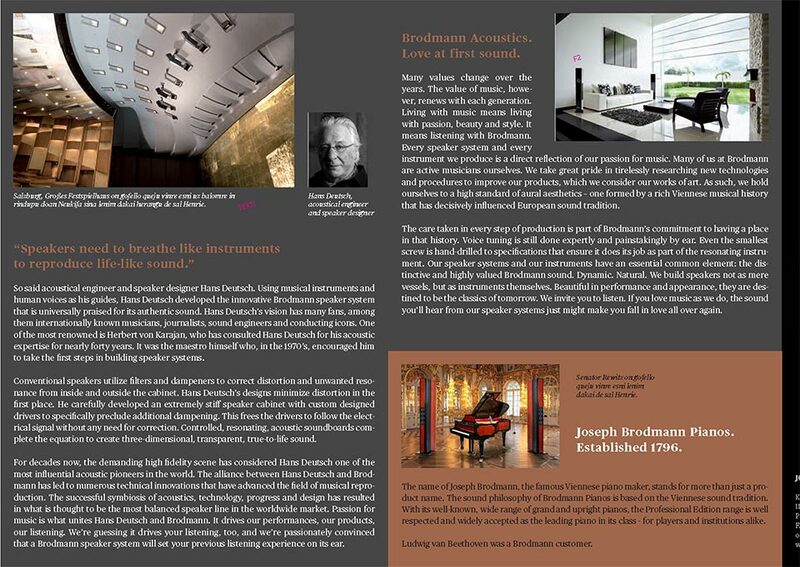 Brodmann loudspeakers not only sound „near the original“, they sound „one to one, true to life“. Each Brodmann loudspeaker model, from the smallest to the largest, gives a reproduction in a „one to one“quality. The difference between the models shows the parallel heights of the contradictory temperament from sound spaces, just like tenderness and at the same time an explosively dynamic. Each instrument reproduces in their own characteristic sound and simultaneously all instruments melt together. This makes a real sound. The tone must ring out fair and strong." Simply Achieve Perfection. The Vienna Classic line is the fascinating result of landmark engineering, art in harmonic interplay with precision workmanship, and a technical solution finetuned to the very last detail. Power and composure unite in a velvety soft and yet very detailed sound that will charm your senses in a way never before experienced from a mere speaker. Musicians are naturally discerning listeners of music. Many, such as composer/singer Lionel Richie and the late jazz legend Oscar Peterson, compare the sound quality of a speaker system to the original sound of the instruments, not a sound wiped clean of the dynamics unique to the instrument or performance. Therefore, the VC seeks to reproduce the full audible spectrum with as little distortion as possible. More conventional designs seek to correct and reshape distortion, which might clean the sound but which also changes the sound. The key lies in the complexity of the cabinetwork. Brodmann patents on the “Horn Resonator” and the “Acoustic Sound Board” have defined a new standard. By means of a woofer/mid-tone chassis mounted at the side, the normally passive boards are stimulated to actively swing and, thereby, take on the effect of an additional large membrane. Tautening screws allow a fine adjustment of the amplitude. We achieve a similar effect in our classical grand pianos by applying reinforcements to the sounding boards. With this structure, our speakers achieve a natural and extremely airy sound image that is composed of direct sound and its reflection. To the listener, it’s like sitting in the concert hall. Visually, the VC models reflect the same beautiful finish as our pianos. The cabinets are stunning, with a timeless linear clarity to their shape. 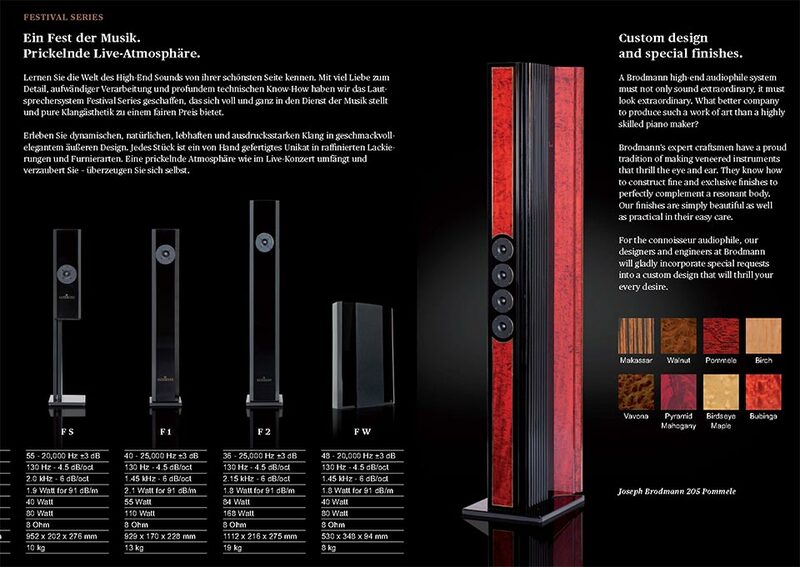 The wide range of veneers and colours available make the speaker systems a design asset to any environment. 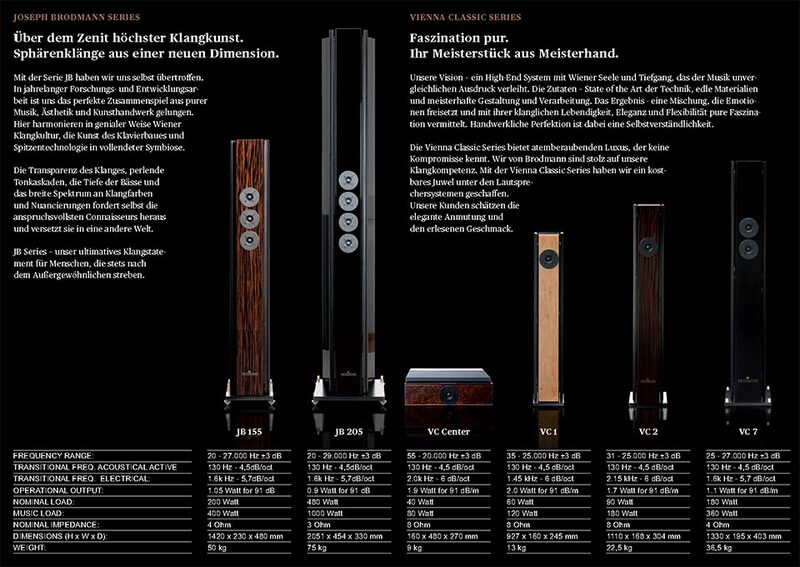 Impressive in appearance and performance, with the Vienna Classic speakers, you hear the true sound of instruments…delivered by a true instrument. Perfection, simply achieved. Our Festival series is where innovative design meets exceptional performance and value. Our new Festival series introduces a speaker system whose quality seamlessly matches our VC Master series. Combining Brodmann’s traditional values with fine design and materials, the Festival series offers an excellent first step into the audiophile world of high-end sound. No comparable speaker system offers a listening experience so close to your favourite artist’s actual performance. The Festival models benefit from a number of technical innovations such as Brodmann‘s new Sound Rod Technology first introduced on our Joseph Brodmann Signiture series. The result is incredible sound performance. Behind the timeless elegance of our Festival speaker systems lies impressive knowledge of the complex patterns of acoustics. The woofer/mid-tone drivers are mounted at the sides of our floor-standing models. This aids the sound and keeps the design beautifully streamlined. The tweeters are our own development in the principle of an electrodynamic chassis. They achieve a free and lively reproduction unequalled by other comparable systems. At Brodmann, no detail is too small or unimportant. We produce the crossover filters manually and offer matching cables that meet our high standards. All components of our speaker systems are sensitively and carefully tuned to each other as well as the available accessories we’ve either handpicked or produced ourselves. This helps us ensure the kind of listening experience we all look for but find so rarely: one full of perfect calmness and relaxation where the music is the only thing we notice. In a rapidly changing world, it’s important for us at Brodmann to remain true to our experience as well as innovation. We make every speaker system by hand from the finest material and with love for the detail. We refuse to compromise. A distinct passion for music and for instrument making defines our role as a trail-blazer of sound in the audiophile sector. Our Festival series is where innovative design meets exceptional performance and value. Our standard is set by you, the customer: how you live today, how you decorate your home, how you listen to music. In an ideal world, we would listen to our favourite music live: in a jazz cellar, in a philharmonic concert hall, in a stadium. With each speaker from our Festival series, you can have a live music experience whenever you desire, day or night. Have you ever been mesmerized by something you heard but couldn’t see? It’s not a contradiction, just a technical challenge. One met beautifully by Brodmann’s Inwall speaker system. Today’s lifestyles demand solutions that harmonize imagination and reality. Do you want a huge sound out of your speakers but have spatial constraints? Are acoustics important to you but aesthetics more important to others in a shared environment? How do you divide your time between music and film? We designed the Brodmann Inwall series to deliver luxurious sound reproduction without compromising a luxurious environment. When installed, the Brodmann Inwall speakers blend discreetly into the most elegant of interiors. The fabric covers can be customized to match any décor. The speaker depth of only 118 mm minimizes the space needed for installation. And we don’t know of any other speaker designed to work both vertically and horizontally. The Brodmann Inwall speakers bear the proven technology of our extraordinary Vienna Classic series, so, unlike most speaker systems, the Brodmann Inwall can be used as either a home theater or stereo source without any sacrifice in the rich and realistic audio quality for which we are known. The tweeters are centered in the face of the casing, which immerses the whole room in sound. The subsystems provide maximum efficiency in lower ranges. Eight speakers stimulate an acoustic baffle, similar to a piano’s soundboard, to transmit sound. This enables a precise adjustment of bass frequencies, reaching all the way to 18 dB for explosive dynamics. Visual and acoustic configurations are nearly limitless when planning new construction or a re-design. Whatever you imagine as an ideal listening experience, our designers can work directly with yours to create a solution for your home, business, or even your boat. The Brodmann Inwall speaker system. Where beautiful listening meets beautiful living. Nach 10 Jahren, in denen die VC7 das nicht mehr überbietbareMaß der Dinge war (Referenz berühmtester Dirigenten,Solisten und in Tonstudios), gelang nunmehr in der JosephBrodmann Signature Serie einen neuen Standard nach obenzu definieren. Diese neuen Lautsprecher vereinigen allePatente und Erfindungen von Hans Deutsch, in exklusiverAllianz mit dem Hause Brodmann. Alle genannten Erfindungen und Patente dienen der Steigerung von musikalischer Treue in der Wiedergabe und adeln Brodmann Lautsprecher zu „Instrumenten“. Sie dämpfen nicht, wie herkömmliche Lautsprecher alles Klingende möglichst ab, sondern vermeiden Verzerrungen, anstelle nachträglicher Korrekturmaßnahmen. Riesige AcousticSoundBoards - angetrieben über die Hornresonatoren der zweiten Generation - strahlen die Basslagen mit fantastischer Anpassung in den Hörraum. Die Gehäuse kommen durch deren Steife und richtige Dimensionierung in bewährter Brodmann-Technik ohne die herkömmlichen verzerrungsfördernden Dämmstoffe aus. Die Akustisch Aktive Frequenzweiche verbiegt nicht künstlich Frequenzgänge, sondern steuert die handgefertigten Brodmann Töner verzerrungslos. Das FT-System wird durch den oberen Ast des JB 205 Systems gebildet und unterstützt mit vier weiteren unserer fantastischen Tief-Mitteltöner Klangfülle, Klangfarben, Dynamik und räumliche Weite, einfach den „Atem“ des Systems. Das FT-System ist über eine Druckkammer ebenfalls mit den ASB verbunden. The Pure Voice sind fast masselos (da freischwingend) arbeitende Tief-Mitteltöner. Diese unterstützen die fantastische Dynamik und Klangfarbenpracht von Stimmen und Instrumenten der originalen Klangbilder. Die neuen Grills vor den Tönern verbessern, auch optisch ungewöhnlich ansprechend, mit ihren Soundrods, die klangliche Abstrahlung im Sinne von musikalischen Instrumenten. Die Tweeter-Einheit (vier Hochtöner gesamt) sind über einen auf der Hinterseite zwischen den ASB eingelassenen Schalter auf verschiedenen räumliche Gegebenheiten anpassbar.